PITTSBURGH—CINDY BREWER SEEMED to attract a small crowd everywhere she went at a recent cartography conference here. If she sat, students and colleagues milled around, waiting for a chance to talk to her. If she walked, a gaggle of people followed. Brewer, who chairs the geography program at Penn State, is a popular figure in part because she has devoted much of her career to helping other people make better maps. By bringing research on visual perception to bear on design, Brewer says, cartographers can make maps that are more effective and more intuitive to understand. Many of the same lessons apply equally well to other types of data visualization. Brewer’s best-known invention is a website called Color Brewer, which helps mapmakers pick a color scheme that’s well-suited for communicating the particular type of data they’re mapping. More recently she’s moved on to other cartographic design dilemmas, from picking fonts to deciding what features should change or disappear as the scale of a map changes (or zooms in and out, as non-cartographers would say). She’s currently helping the U.S. Geological Survey apply the lessons she’s learned from her research to redesign its huge collection of national topographic maps. “It’s all about matching perceptual dimensions with data dimensions,” Brewer said when I managed to catch up with her at the annual meeting of the North American Cartographic Information Society. Brewer has been thinking about these issues since her graduate days at Michigan State. 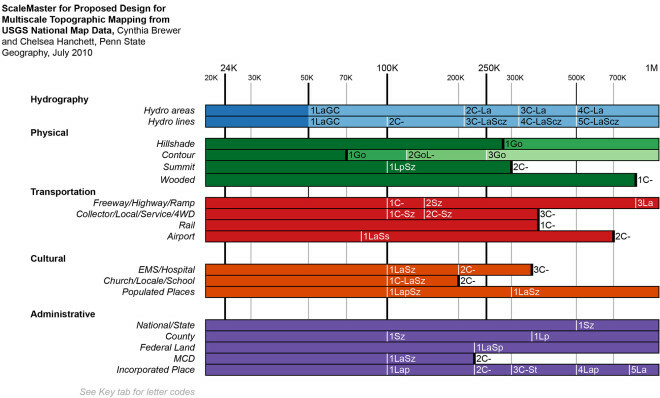 But the idea for Color Brewer grew out of a sabbatical she did with the U.S. Census Bureau, overseeing the atlas that accompanied the 2000 Census. “We were trying to be really systematic with color throughout the atlas,” she said. Other mapmakers liked the color sets they developed and began asking for them, and Brewer set up Color Brewer to make them more readily available. The site has a simple, intuitive interface that forces you to think first and foremost about what kind of data you are trying to map. Do the values go from low to high, as with population density or temperature? Color Brewer will steer you towards a color scheme that progresses from light to dark. It will not allow you to make the rookie mistake of picking a rainbow palette. If, on the other hand, what’s interesting about your data are the deviations from the mean—as in areas where unemployment is above and below average—Color Brewer will steer you toward a diverging color scheme, with reds at one end, say, and blues at the other. If you’re mapping different categories, such as different religions or ethnicities, Color Brewer will suggest a mix of up to 12 colors that are easy to distinguish. Fewer is usually better. After about seven, Brewer says, it gets really hard to tell them all apart. You can also toggle buttons to eliminate color schemes that can’t be read by color blind people or ones that don’t photocopy well. Finally, you can see your choices applied to a sample map to check that each of the colors you’ve chosen is easily distinguished from the others. A big reason people run into trouble with their color schemes, Brewer says, is the way color picking is done in many software programs. Take the RGB cube (or sliders) many programs use to display colors along red, green, and blue axes, for example. “That’s not the least bit perceptually scaled,” Brewer said. “In some parts of the cube a tiny step gives you a huge perceptual difference. In other parts it all looks the same.” If you want to create a series of greens (for instance) that vary from light to dark, but keep the hue and saturation the same (which happens to be a good way to represent sequential data), there’s often no easy and intuitive way to do that. But some software developers are starting to catch on. Brewer doesn’t keep track, but her color schemes have been embedded in several software packages, including the statistical and graphics program R, and ArcGIS Pro, a new product for professional cartographers from Esri, the dominant producer of mapmaking software. Color isn’t the only design element that could benefit from this type of standardization. Recently, Brewer has turned her attention to scale. As a map zooms out to cover a larger area, some features need to disappear or change size to keep the map from getting too cluttered. Brewer and colleagues have developed a tool called ScaleMaster to help mapmakers decide which features to include at a given scale, and how to change things like the thickness of lines and the size of symbols and text to keep their maps legible. So far, it’s just an Excel spreadsheet available on Brewer’s website. 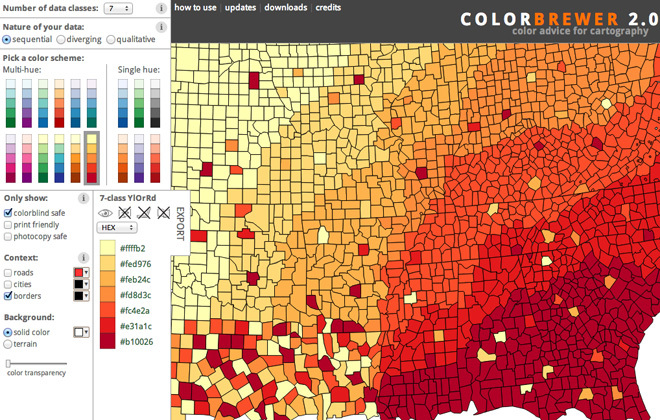 “It’s a much rougher tool than ColorBrewer, but if you’re doing multi-scale mapping it’s very useful to keep track of what features should change,” she said. The same approach could also be applied to fonts. “Fonts are like hues,” Brewer said. “They give a map different looks.” Fonts can make a map look jaunty or serious, for example. They can help emphasize important information. Bad font choices can undermine the map’s intended message. One of Brewer’s PhD students, Elaine Guidero, is investigating what essential characteristics imbue a font with a particular tone, or personality, so to speak. Brewer’s influence on cartography is far-ranging. Others have imitated her approach, developing a TypeBrewer and a Map Symbol Brewer. She’s seen her color schemes in everything from financial charts to brain imaging studies. “It’s pretty cool when I’m just minding my own business, reading a magazine or paper, and I see one of my color schemes,” she said. She doesn’t collect examples; more often her colleagues send them to her. One Penn State colleague even used ColorBrewer to choose colors for her office. “She picked a nice magenta color sequence,” Brewer said.